In 1863, Confederate Brigadier General John Hunt Morgan led his men on an unauthorized raid of Indiana and Ohio. One hundred and forty-eight years later, two professors at Ball State University got together to determine how to engage fourth-graders in this story. The Civil War is a key topic of fourth grade social studies in Indiana, and Morgan’s Raid is arguably the most significant part of the state’s Civil War history. The lack of age-appropriate materials and the dramatic flavor of the story gave us the opportunity to create a history education game for use in the classroom. 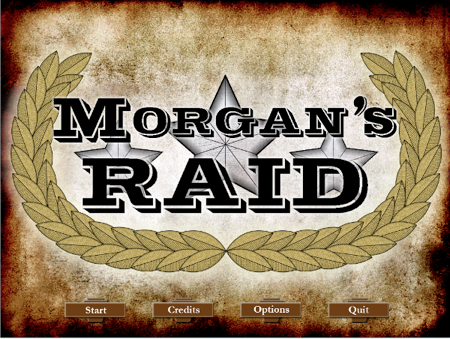 The result of our efforts is the Morgan’s Raid game, which we released earlier this Summer. The development process spanned three 15-week semesters. In the first semester, we led an interdisciplinary team of eleven undergraduates on an exploration of the design space. This team learned about the history of the raid, the challenges of teaching social studies, the science of learning, and theories and techniques of game design. This resulted in a set of physical prototypes and a design specification. The following semester, the 25 students in my game programming course (a junior-level elective in the Computer Science department) developed the game engine and built the first playable digital prototype. In the final semester, eight developers worked with our artist and historian to produce the final version of the game. A key decision that was made early in the design process was that the player would take on the role of John Hunt Morgan. This was a contentious decision as we knew that the player would identify with the protagonist, and yet the target of Morgan’s aggression was Indiana—the player’s own state. When we playtested a digital prototype with fourth-graders who had not yet studied Morgan’s Raid, we observed that they adopted the role of Morgan without questioning their imposed goals and motivation. After playing the game, we asked if Morgan was “a good guy or a bad guy.” Most quickly responded that he was a good guy, and when asked to explain, they answered that he must be the good guy because they controlled him. Simply by posing this question, however, some students began to question their assumptions. One student pointed out that, in the closing cinematic, Morgan ends up in prison. In admirable fourth-grade logic, this means he must be a bad guy, because good guys do not go to prison. With another group of testers, when we asked where Morgan was raiding, the students acknowledged that it was Indiana. Once again, through moderated discussion, the students began to consider that perhaps Morgan was not a “good guy.” Identification with the protagonist was an expected default response, and it exemplifies the strength of structured reflection to fostering learning. Note that our design goal was neither to demonize nor glorify Morgan, but to represent historical events and to foster the development of multiple perspectives. The game design underwent significant evolution between the end of the first semester—when the design document was written—and the release in early Summer 2011. The design document required the player to decide, at each town, whether to raid, avoid the town, or deceive the population into giving him supplies. These are historically-accurate options, and selection was to be made through a three-button dialog box. During the second semester, as more variations and features were considered, more dialog boxes were added. Two weeks before the end of the semester, we had our first feature-complete digital prototype. Internal playtesting forced the team to make a startling realization: the game was not fun. We had approved beneficial, incremental alterations to the design but had failed to foresee that the sum of these was a monotonous chain of click-through dialog boxes. The aftermath of this realization demonstrates the success of the project as a learning experience: the team was forced to acknowledge their mistakes, reflect on the causes, and develop solutions that would fit into the project schedule. I am pleased that the team went immediately to the most powerful tools of game design: whiteboard, markers, construction paper, scissors, and Skittles. By the end of the semester, the team had built a shared vision of a resource-allocation game much like the one we finally shipped. This illustrates what I consider to be the greatest learning opportunity inherent in game design and development: the internalization of design thinking. Design thinking provides a disposition to approach open-ended design problems in a way that complements the philosophy of agile software development. I am partial to George Kembel’s formulation of design thinking, which presents a five-step cycle of empathy, identification, ideation, building, and testing. Playtesting with end-users was crucial to the team as it allowed them to develop empathy, not just intellectually but also tacitly and emotionally: the team had been physically in the spaces where the game would be played, and they had sat and engaged with “real live ten-year-olds.” Following Scrum with two-week sprints, we were building something that could be tested every two weeks, and we were taking the time to reflect on our successes and our failures. These students were immersed in reflective practice, and already I have been able to see them apply these principles to new problems and domains. Mentoring the team through the design and development of Morgan’s Raid has been the most personally and professionally rewarding experience of my career so far. I am proud of how the interdisciplinary team learned to trust and respect each other. I believe this project is an exemplar of the potential for the future of higher education. We were fortunate to have significant internal support for the project, but we were also very lucky that students’ schedules worked out as they did. It is my hope that higher education reform will consider projects such as this and others featured on this blog as ideal candidates for the new normal for student learning experiences.